The 210th Rescue Squadron (210 RQS) is a unit of the Alaska Air National Guard 176th Wing located at Joint Base Elmendorf-Richardson, Anchorage, Alaska. 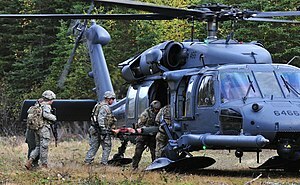 The 210th is equipped with the HH-60G Pave Hawk helicopter. Nicknamed "The Second 10th", the 210th RQS has been bestowed the Lineage and Honors history of the 10th Air Rescue Squadron (ARS), an active duty squadron organized at Elmendorf Field in 1946 and mostly manned by Alaskans. The 10th had itself inherited the tradition of the 924th Quartermaster Company, Boat (Aviation), a rescue unit which was constituted in Alaska on 14 June 1942, saw action during the Aleutian Island Campaign, was redesigned the 10th Emergency Rescue Boat Squadron on 3 July 1944, and was inactivated on 8 March 1946. During the late 1940s and early 1950s, the 10th ARS operated detachments at Elmendorf AFB, Ladd AFB and Adak Naval Station. The squadron operated a mixture of OA-10s, OA-12s, SB-17 Flying Fortress, C-45s, L-5s, LC-126As, R-5 Helicopters and CG-4 Gliders. 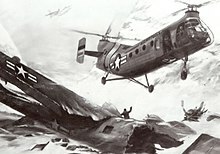 Artist's concept of a 10th Air Rescue Group SH-21 coming to the assistance of the crew of a 5040th Radar Evaluation Squadron TB-29 (44-70039) out of Elmendorf AFB that crashed in the Talkeetna Mountains, north of Anchorage, Alaska on 15 November 1957. Six were killed and four survived, kept alive by the least injured survivor. An SA-16 Orbits overhead, providing communications. The 71st ARS, however, was re-designated as the 71st Aerospace Rescue and Recovery Squadron on 25 Nov 1969 and re-activated on 8 March 1970. After re-activation, the 71st served Alaska proudly during the 1970s and 1980s including the rescue of 74 people from the sinking cruiseship MS Prinsendam in the Gulf of Alaska on 4 October 1980. In 1987, the Air Force announced the 71st would again be inactivated. However, the tradition of Arctic search and rescue would continue; Alaska Senator Ted Stevens introduced legislation creating a new search and rescue unit for the Alaska Air National Guard. The 210th ARS received federal recognition from the National Guard Bureau on 4 April 1990 and the unit activation ceremony was held at Kulis Air National Guard Base on 11 August 1990. The 210th took delivery of its new Sikorsky HH-60 "Pave Hawk" search and rescue helicopters between June and August 1990 and new Lockheed HC-130 search/tanker aircraft in November and December 1990. The unit achieved initial operational capability faster than the normal Air Force programming process normally allows. The 210th began sharing the 24 hour Alaska Theater overland helicopter Search and Rescue alert with the inactivating 71st ARS on 1 January 1991 and assumed the entire helicopter alert on 1 April 1991. The HC-130 began daytime alert in April 1991 and assumed 24 hour alert in May 1991. The 71st ARS inactivated on 30 June 1991. (Subsequently, the 71st ARS has been re-activated as an active Air Force unit at Patrick Air Force Base, Florida). In January 1992, the 210th achieved combat-ready status. In 1993, additional aircraft were added to the squadron inventory. On 1 January 1994, Detachment 1, 210th RQS was activated at Eielson Air Force Base, Alaska, to perform search and rescue for Eielson-based fighters and to perform logistical range support for the northern military ranges. In early 1995, more new HH-60 aircraft joined the 210th and the original HH-60s were transferred to other units. In 1996, the squadron received new HC-130 aircraft and transferred its original HC-130s to another unit. The 210th possesses state-of-the-art "force multipliers". Its Pararescue officers and men are all highly trained in all manner of combat insertion and recovery, including SCUBA and military freefall parachute; all the men are Paramedics and even the officers are Emergency Medical Technicians. On 8 October 2004 by the Air Force Special Operations Command re-organized Air National Guard rescue units and created separate squadrons for fixed-wing, helicopter and pararescue elements of the 210th Rescue Squadron. The HH-60 helicopter flight became 210th Rescue Squadron; the HC-130(H)N Hercules flight became the 211th Rescue Squadron, and the pararescue flight became the 212th Rescue Squadron.